The word 'Rinanubandh' literally means 'Karmic debt'. It is an impossible task to write the exact meaning of this word, as a lot of the nuances are lost while doing so. When you read about the lives of Baba's devotees you realise that it has a deeper meaning. A bond that has existed for many generations. His devotees came from varied backgrounds. Some highly educated, others were rustic villagers. Some were young, while others were middle-aged and set in their ways. They went to Shirdi not knowing what to expect. Others went there by chance. But once they met Baba their lives were changed forever. And the 'Karmic bond" started unfolding. Thus they returned time and again to be with the living God who blessed them and gave them a handful of udi. In the years that followed, no matter what befell them they knew that Baba was always with them. This book is a kaleidoscope of leelas, photographs and the lives of Baba's devotees. It will make the reading of Shri Sai Satcharita easier and fruitful. Vinny Chitluri was born in Arvankadu (Nilgiris), but was educated in Jabalpur (Madhya Pradesh). She did her postgraduation in Pediatrics from Kalawati Saren Hospital, Delhi. Then she went to the U.S., passed the board examination and was conferred the 'Diplomat of the American Academy of Pediatrics'. While in the U.S. she started thinking seriously about her Karmic bonds with her family. As her father worshipped Baba she was also able to do the same from a very young age. She has been worshipping Baba for sixty years. Her relationship with Baba is that of a 'best friend' as He loves her no matter what she does. She retired from the medical profession at the age of fifty and came to Shirdi in 1994 and settled there. Then she set about trying to know more about Baba. She soon realised that 'the more she learned about Him the more ignorant she was’. Alas, it would take her many lives to know a little about this inscrutable God. But her quest is on-going. My father in 1950, on one of his visits to Shirdi brought N.V. Gunaji's Shri Sai Satcharita. We took turns to read it. At that time I read it more like a storybook. I learned about Baba's leelas and His divinity. Through the years I read and reread it. But I could not understand many things. For instance, Mrs Tarkhad's son was sitting in the Dwarkamai right in front of Baba, yet he wanted to return home to offer naivedya to the photograph? Who was this child? Why couldn't he just offer naivedya to the Shaktar Ishwar sitting in front of him? Was there another story in this story? (Shri Sai Satcharita, Chapter 9]. It bothered me a lot that Baba who had control of the elements [Shri Sai Satcharita, Chapter 11] who was "Deva di Dev" [God of God's] lost a wrestling bout with Mohiddin? [Chapter 5]. The Parabhrama, who made this shrishti [cosmos], and guided it! He who was omnipresent and omnipotent, after losing this match wore a torn kafni. Why a Kafni? What did it symbolise? Baba, though God Almighty on a personal level was close to the common man, the rustic villager; the well educated, and famous devotee. The rich and the poor, the famous and not so famous flocked to His feet. Was it because of His 'chamatkars'? Or was it His equality of vision? 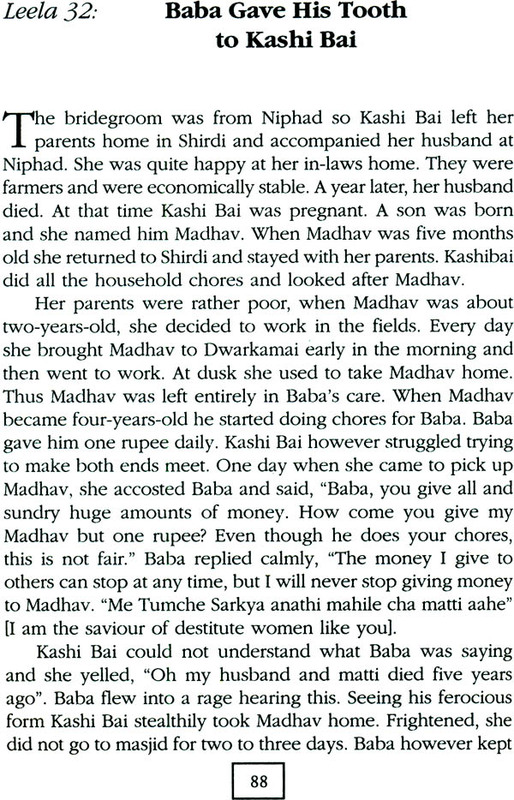 Was there something deeper, a rinanubandh [karmic ties or debt] that brought them to Shirdi? They came not knowing what to expect! And they stayed devoted to Baba for the rest of their lives. His divinity, His love, and compassion, His equality of vision endeared Him to every devotee. Almost in each and every chapter of the Shri Sai Satcharita there are portions, words and parables that I could not understand. So I set out trying to find some answers. Along the way I met the descendants of these "Ankita Bhaktas". I pestered them with questions about their grandparents. I read various books, old Sai Leela magazines, and other books and found some answers there. At other times I drove my friend Manjula nuts. I coerced her to read the Upanishads and Nirukti and find answers for me. "Do anything, read anything but give me answers with references," I said. And she did. That's what Gurus are supposed to do! Not all the material is in this book. I for one found many answers. As I am sure many of you did. Some I have included, and you may have found other answers. But at least it is a start. This book is a kaleidoscope, of leelas, photographs, and lives of some devotees which illustrate the karmic and rinanubandhic ties with Baba. I strongly believe that the visuals stay with us for a long time. I hope, that this book will make reading of Sbri Sai Satcharita easier and fruitful.